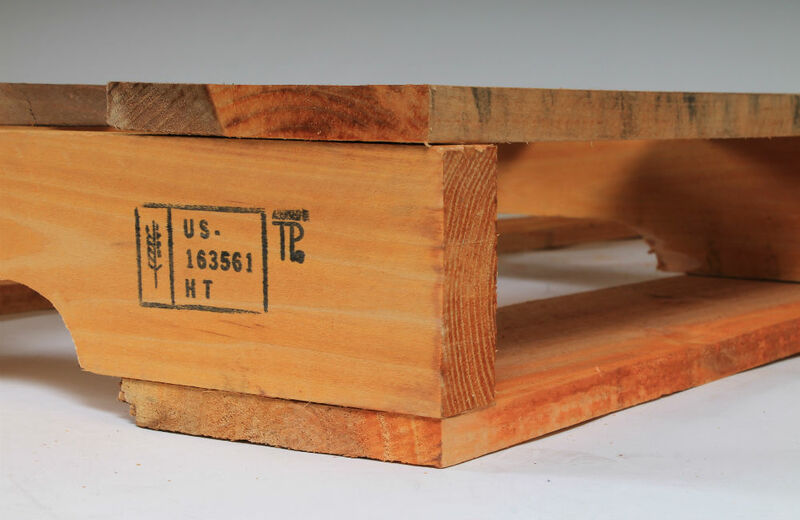 If your company is shipping internationally then you will need to have pallets that are ISPM-15 certified. Challenger Pallet is certified on a monthly basis by Timber Products Inspection. Over the years as global shipments between countries have increased, so too has the use of pallets. Foreign species of lumber which sometimes harbor bugs have moved across the seas and borders where they previously couldn’t travel. By heat-treating the lumber in pallets, manufacturers are able to prevent the spread of any invasive insect species. What does the process of heat-treating pallets entail? At each of our facilities, we have large chambers with industrial propane or natural gas burners and fans. These buildings hold about 400 pallets. We are required to heat-treat each pallet in these ovens. The thickest part of the pallet, which is generally the 2x4, is heated until the temperature at the center reaches 140 degrees Fahrenheit. We then hold the temperature at or above that mark for 35 minutes. This ensures that the pallets are bug-free at this point. We then stamp the pallets on each side with our ISPM-15 stamp making your pallets certified for international export. Give us a call if you have any further questions regarding heat-treated pallets or this process.